Special Counsel Robert Mueller walks past the White House after attending St. John's Episcopal Church for morning services on Sunday, March 24, 2019. 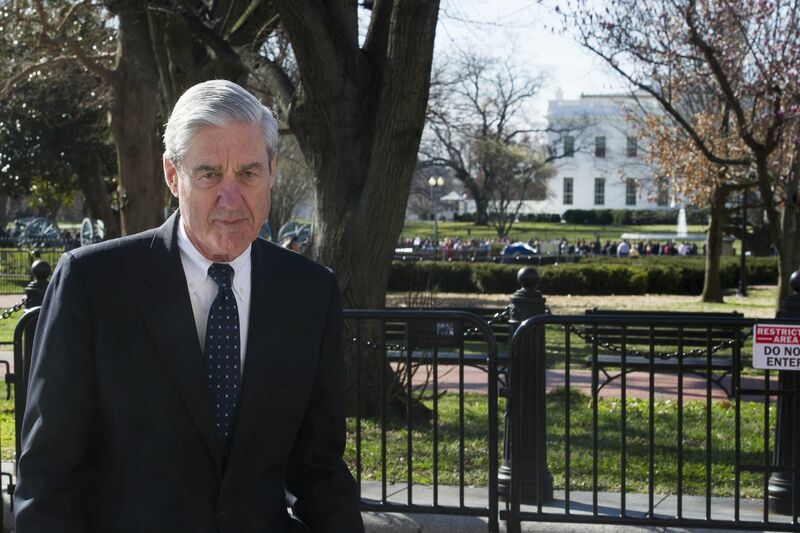 Special counsel Robert Mueller did not find evidence that President Donald Trump or his top aides colluded with Russia during the 2016 election, Attorney General William Barr said in a letter to Congress Sunday night. Barr’s summary of the report’s findings prompted a day of intense back-and-forth, with the White House cheering the conclusions and claiming victory, while Democrats questioned the impartiality of the attorney general. Here’s what happened Monday as the Trump administration, lawmakers, and journalists responded to Barr’s summary of the Mueller report. After months of uncertainty surrounding the Mueller investigation, Republican lawmakers and White House aides have launched into an attack on House Intelligence Committee Chairman Adam Schiff (D., Calif.), demanding the Democrat resign from Congress and alleging he promoted claims of collusion between Russia and the Trump campaign. Trump adviser Kellyanne Conway (a South Jersey native) demanded Schiff resign “today,” while Donald Trump Jr. taunted the congressman on Twitter. In a mass letter to network television producers, Tim Murtagh, Trump’s communications director, also named Schiff on a “list of guests who made outlandish, false claims” regarding the Russia probe during television interviews. “Moving forward, we ask that you employ basic journalistic standards when booking such guests to appear anywhere in your universe of productions,” Murtagh’s letter said. Others on the list include Sen. Richard Blumenthal (D., Conn.), Rep. Jerrold Nadler (D., N.Y.), Rep. Eric Swalwell (D., Calif.), Democratic National Committee Chairman Tom Perez, and former CIA Director John Brennan. During an Oval Office meeting with Israeli Prime Minister Benjamin Netanyahu, Trump told reporters he through Mueller acted honorably, and that it “wouldn’t bother me” if Barr decided to release the special counsel’s full report to the country. “We’re glad it’s over. It’s 100 percent the way it should’ve been,” Trump told reporters, answering a question about whether Mueller’s investigation turned out not to be a “witch hunt,” as the president often referred to the Russia probe over the past two years. Reporter: Did this turn out to not be a witch hunt after all? However, according to Barr’s letter, Mueller reached no conclusion on whether there was obstruction of justice. As fallout surrounding the Mueller report consumes Washington, Israeli Prime Minister Benjamin Netanyahu is visiting the White House. The visit highlights the friendly relationship between Trump and Netanyahu, who is facing four counts of corruption charges as he vies for reelection next month. The prime minister is cutting short his White House visit after a rocket launched from the Gaza Strip struck a home in Israel overnight. South Carolina Republican Sen. Lindsey Graham, chairman of the Senate Judiciary Committee, vowed to investigate the origin of the FBI’s investigation into possible collusion between the Trump campaign and Russia. "The FISA warrant issued against Carter Page based on a dossier prepared by Christopher Steele is at a minimum disturbing. Whether or not it’s illegal, I don’t yet know. So I’m going to get answers to this,” Graham told reporters Monday on Capitol Hill. Graham also told reporters he intended to look back at former FBI director James Comey’s investigation of Hillary Clinton’s private email servers, and why then-Attorney General Loretta Lynch recused herself. He also said he wanted Barr to testify before his committee in a public hearing. “The truth is I want you to know as much as there is to know,” Graham told reporters. The Supreme Court has refused to hear an appeal from a mystery corporation that has refused to turn over information subpoenaed by Mueller. Prosecutors have been attempting to get information from the company, which said in redacted court filings it was a witness in Mueller’s investigation. The Supreme Court’s decision comes after Mueller has wrapped up his investigation, so it remains unclear how the subpoena for information will proceed. The current status of the grand jury impaneled in the case is also unclear. Following Mueller’s assessment on collusion, it didn’t take long for reporters and pundits to draw criticism from both the left and the right for their intense coverage of the special counsel’s investigation. “Nobody wants to hear this, but news that Special Prosecutor Robert Mueller is headed home without issuing new charges is a death-blow for the reputation of the American news media,” Rolling Stone columnist Matt Taibbi wrote over the weekend. Reporters and editors have largely responded Monday by defending their coverage of Mueller’s investigation. The Times and the Post shared a 2018 Pulitzer Prize for their reporting on the investigation into Russian interference, including revelations about contacts between Kremlin-linked figures and Trump associates and advisers. “I don’t seem to recall these same pundits demanding journalists apologize for aggressively covering the Hillary Clinton email probe after James Comey decided not to bring charges,” CNN’s Oliver Darcy wrote in Brian Stelter’s Reliable Sources newsletter. During an appearance on the Today show Monday, White House Press Secretary Sarah Sanders bristled at the idea Trump owed Mueller an apology for his repeated attacks on the special counsel’s investigation. “This should never happen to another president, and we want to make sure that the institution of the president is protected,” Sanders said. Jay Sekulow, an attorney for Trump, said on MSNBC Monday morning he expected the bulk of Mueller’s report would be made public by Barr in short order. “There’s a process and steps they have to go forward, but I suspect that [Barr] will make as much of it public as possible, and it’ll be sooner rather than later,” Sekulow told Morning Joe co-host Joe Scarborough. “As a lawyer, you don’t waive privileges and you don’t waive investigative detail absent either a court order or an agreement between the parties,” Sekulow told New Day co-anchor Alisyn Camerota. “And you’d have to weigh a lot of factors there on how that affects other presidencies." "As a lawyer, you don't wave privileges ... I think that would be very inappropriate." Like many Democrats, both Pelosi and Schumer are both pushing for Mueller’s full report and its underlying documents to be released to Congress. Rep. Jerry Nadler (D., N.Y.), the chairman of the House Judiciary Committee, wrote on Sunday that his committee would call Barr to testify about his findings and his determination — based on Mueller’s evidence — that Trump did not attempt to obstruct justice. • Why Mueller decided not to make a judgement on whether Trump attempted to obstruct justice. • What Mueller actually said about obstruction of justice in his report. • If there was no collusion, why did so many people in Trump’s orbit — including his former campaign chairman — lie about their interactions with Russians?